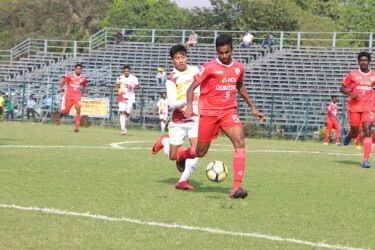 Uttam Rai scored a hat-trick while Bektur Uulu and Nicholas Fernandes netted braces in the Red Machines’ emphatic victory. 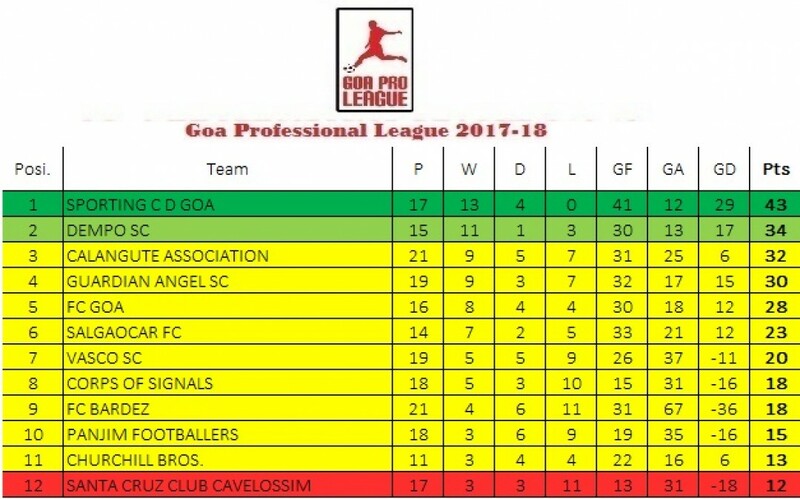 Churchill Brothers Sports Club registered a hammering 10-0 win over struggling FC Bardez in the Goa Professional League match played at Duler Stadium earlier today. With these three points, Churchill moved up from the bottom of the table with 13 points from 11 matches, while Bardez remained at the 9th place with 18 points from 21 matches. 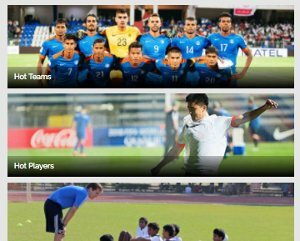 Churchill who had defeated Corps of Signals in the last match made three changes to their side as coach Alfred Fernandes brought in Uttam Rai, Israil Gurung and goalkeeper James Kithan in the starting XI, while Bardez assistant coach Climax Lawrence also made few changes to his side which lost to Calangute Association in the previous round match as Chatur Naik, Viraj Naik and Gaurav Vaigankar made into the cut. Churchill had the best chance to take the lead in the very 3rd minute when Nicholas found Trinidadian forward Willis Plaza in front of the frame but Bardez keeper David Chauhan tipped his shot above the crossbar for a corner. However, in the 11th minutes, Churchill opened their account through Kyrgyzstani midfielder Bektur Uulu. The midfielder smartly tapped in from 6yards to Nicholas’ fine low cross from the left wing. Trinidadian frontman Plaza made it 2-0 for the Red Machines in the 19th minutes when his curling shot from the top of the box finished in the goal to double Churchill’s lead. Churchill further inflated their lead when Uttam smartly headed in from close off a perfect corner from Nicholas in the 27th minutes. Five minutes later, Churchill U-20 midfielder Sevlon Cardozo stylishly placed the ball in the back of the nylons after receiving a through pass from Plaza in the box to make it 4-0 to put Churchill on the driver seat. Churchill had two great chances at the start of the second session but first, Pankaj Sona’s shot from close was brilliantly blocked by Bardez keeper David in one-on-one, while a few minutes later, the forward headed wide from point-blank range off Gurung’s perfect cross. 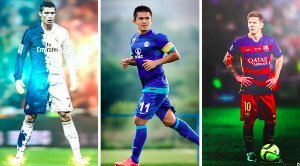 However, at the hour mark, Uttam danced past two defenders and placed the ball in the back of the nylons from close to make it 5-0 for the I-League outfits. Two minutes later, Bektur completed his brace when he blasted in from close off Suraj Singh’s header pass inside the box. It just more two minutes passed when Nicholas added his name to the scorer list when his curling shot from the top of the box entered the top corner making it 7-0 for the Red Machines. Uttam completed his hattrick in the 72nd minutes when he dribbled past two defenders in the box and shot past Bardez keeper David from just inside the box. Two minutes later, Nicholas also completed his brace when his shot from inside the box beat the Bardez custodian to make it 9-0 for the Red Machines. With just a minute left on the clock to full-time whistle, Pankaj scored a spectacular goal from the acute angle to register the biggest win of the season.